Pythons, the sophomore LP from West Palm Beach’s Surfer Blood, is not particularly great, nor is it particularly terrible. If I had to sum it up in two words: it exists. Where Surfer Blood’s debut album Astro Coast had nonstop jolts of infectious energy, West Coast nostalgia and an indie edge to ensure that the album didn’t feel too smooth and manicured, Pythons sounds like the result of a focus group whose purpose was to select 34 minutes of music you’d most like to hear playing during a Shamwow or Oxyclean commercial. 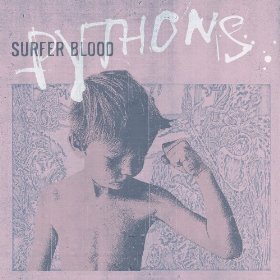 Big label fingerprints stain every inch of Pythons, which, coincidentally, is Surfer Blood’s first record with Warner Bros. Pythons is more processed than Twinkies with just as much complexity, but not nearly as delicious. Consistently bland and putting forth dubious effort to be charming and nonthreatening, Surfer Blood lays out ten safe tracks where even the most notable peak their head just above the level of mediocrity. Pythons opens up with one of the album’s more promising tracks, “Demon Dance.” A good, clean hook is surrounded by optimistic harmonies and slightly rough edges, resulting in the balance that should have been the trademark for the entire record. Other standouts are the endearing, speedy, “Say Yes to Me,” and the gentle, off-kilter “Slow Six.” However, at their core, even with these promising tracks, you can see a little crack in the armor where substance is beginning to leak out for the sake of easily digestible style and rudimentary lyrics (“You and me are apples in trees/don’t fall far from me”). Pleasant sure isn’t awful, but it is not the reaction I want to have from a band whose first album was an impressive piece of surf pop/rock. Maybe on their third record, we’ll get something that inspires us to do more than make our whites whiter or blend a fruit smoothie in 30 seconds, two things that aren’t particularly great, nor are they particularly terrible.